Spain has great meat, wonderful cheese and outstanding almonds; Valencia and Marcona almonds. These almonds are nice and big, and a great snack. 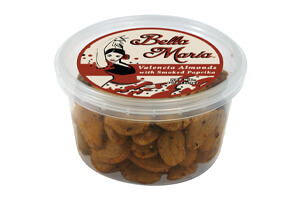 These Valencia almonds are spiced with smoked paprika, another typical Spanish flavor. Enjoy them with a glass of wine or sherry, some Manchego or Idiazabal cheese and some crispy tortas and you'll have your own Spanish party. Ingredients:blanched Valencia almonds, sunflower oil, paprika, sea salt.